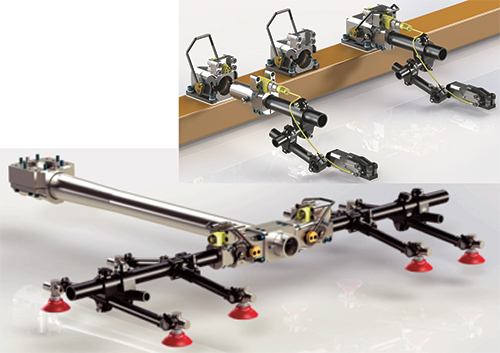 Responding to industry needs for faster and more efficient automated pressroom stamping lines, De-Sta-Co, Auburn Hills, MI, introduces the Accelerate collection of lightweight end-of-arm automation tooling. The end effectors reportedly are as much as 50 percent lighter than their predecessors, translating into production-line speed gains of 25 to 30 percent. Also, the lightweight end effectors improve ergonomics, resulting in higher worker-safety ratings. Accelerate tooling is of high-strength aircraft-grade aluminum, allowing minimum wall thickness and overall weight without sacrificing strength and allowing stampers to maximize load-carrying capacity. This approach also eliminates the need to use more expensive, longer-lead-time materials such as carbon fiber. Accelerate components also have trimmer, more elegant shapes than their predecessors. Greater flexibility provided by CNC machines, tooling and fixtures let De-Sta-Co contour the components to eliminate unnecessary bulkiness and weight. Further weight savings come from specifying thin-wall extruded tube instead of heavier solid bars or thicker-wall tubing.